The Timeline in Moovly Studio is organized in Clips, groups of objects that belong together. Moovly Studio contains a Clips library with pre-animated clips you can use and adapt to your needs. 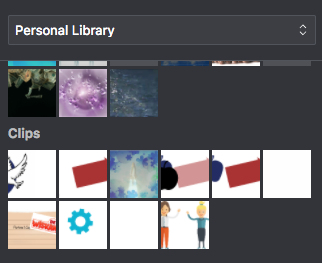 You can also create your own Clips and save them to your Personal Library. When you create content with repeating structures, such as a title introduction, an agenda or table of contents, end credits or other typical visual patterns, you can save these in Clips for easy reuse. When you want to copy a piece of content from one Moovly project to another, you can organize that content in a Clip, save it and, in your other project, paste it by dragging it to the Stage. To use a saved Clip, just drag it from the library to your Stage. When you adapt the Clip on the Stage or the Timeline, the saved Clip will not be modified. If you would like to update or change the saved Clip, save the modified version to your Personal Library and delete the first version.